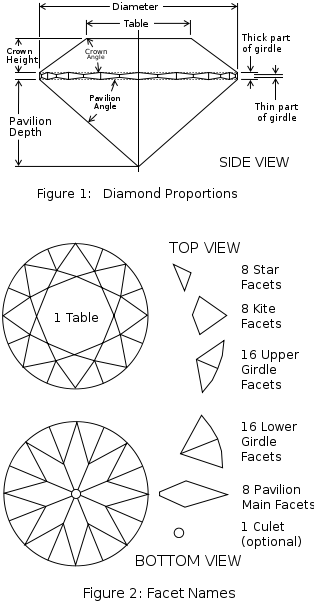 The flat area on top of the diamond is called the table. This acts like a window through which you can see down into the diamond. The top part of the diamond, which normally accounts for a third of the height of the stone, is called the Crown. This starts at the table and ends at the girdle. The girdle is the widest part of the stone and is the place where the diameter measurement is taken. It is where the Crown and Pavilion meet. The Pavilion area on a diamond is the angled section under the girdle, which meets at the bottom of the stone. The point at which the facets of the Pavilion come together is known as the Cutlet. Sometimes this is simply a point where all the facets meet but sometimes it is flat, adding an extra facet to the stone. Different shaped diamonds have different numbers and arrangements of facets which gives each style a different style and amount of sparkle, but the terminology for each part of the diamond remains the same. The illustration demonstrates the facet pattern of the most popular shape of diamond, the round or Brilliant cut. Take a look at the shape page for more information about other cuts of diamond.